Bengeance: What have the camera companies been doing with their time? What have the camera companies been doing with their time? I'm going to imagine a camera for a moment, will you picture it with me? I like to be able to carry a nice camera with me wherever I go, so this camera we're picturing has to be small, really truly pocket sized. Just big enough to hold in the hand, and not much more than half an inch thick. The picture quality has to be good, otherwise why bother? I need to be able make decent looking prints at least up to 8x10. I need at least a standard 3x zoom. And of course I want it to be fast, very fast. Startup time of under a second. Shot to shot time of under a second. Shutter lag, including focusing, of under a second. And I want a continuous shooting mode that allows me to shoot at least 3 full res pictures per second until the memory card is full. I like to shoot video occasionally, at least 640x480 at 30 fps, and I want to be able to zoom while shooting. Oh, and even though it's a point and shoot, I like to have some manual control. Manual ISO and white balance are pretty standard of course, but I also want aperture priority mode, and a shutter priority mode that allows long, multi-second exposures for cool night shots. Oh, and manual focusing. Who am I trying to kid? A half inch thick point and shoot that fast? With decent picture quality? And seriously, manual focus? That's just being unreasonable, right? What am I trying to do, describe a fantasy camera from some magical utopia full of ponies and rainbows? No. I'm describing the Kyocera SL300R, and it was released in September of 2003. Which I think begs the question: what the heck have the camera companies been doing with their time for the past five years? Digital Photography Review just posted a comparison review of nine current ultra compacts, you should read it. Go on, I'll wait. Guess what? Only one of the nine cameras is as small as that Kyocera. None of them are as fast, not even close. They all allow shooting video at 640x480 (one of them at 720p), but they don't let you zoom. Manual controls? Forget about it. Picture quality? No better, often worse. 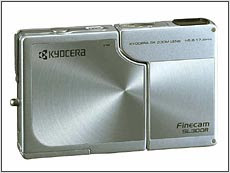 Oh, sure, most of these cameras have 10 megapixels instead of the Kyocera's 3.3, but to what end? The chips are the same physical size, and the increased pixel density means that noise, and noise reduction artifacts, eliminate any potential resolution benefit. That, combined with generally crappy folded optics prone to smearing and fringing, means that these cameras, just like the five year old Kyocera, can produce decent prints only up to about 8x10. How's the modern crop of cameras doing so far? Size: worse. Speed: worse. Video: worse. Manual controls: worse. Zoom range: no better (in most cases). Battery life: no better. Picture quality: no better. So again I ask you, what have they all been doing with their time? Sure, they've been pixel-packing, I've no doubt that's a difficult engineering task. But since its detriments outweigh its benefits, it seems like a dubious enterprise at best. They've invented an awful lot of clever stuff like face tracking and smile detection. But why, exactly? Not even my mom wants smile detection, and no one wants to avoid having to think about her camera more than my mom. In a careful reading of that review of nine state-of-the-art ultra compacts, I can find only one single genuine improvement over the Kyocera, and that's optical image stabilization (which only five of the nine cameras have). Or do they know something I don't? After all, those companies are all still making cameras, and Kyocera isn't. Are people that impressed by a big megapixel number? Are gimmicky features really that much more important than size, speed, and picture quality? Answers on a 3x5 postcard please. Or in the comments. Amen, brother. Maybe we could design our own? :) And when they get back to work, they can delete that useless digital zoom. I have this camera and while I agree with many of your points, there were good reasons for this particular camera to die. Control was fussy, it was useless in low light, and the image quality is easily outclassed by cameras with just a little extra girth. I do miss the twisting body though. But if you want that and svelteness, you're putting a hard limit on the front element size of your lens. The front element on the LX3's lens is over twice as big in diameter as the Kyocera's body is thick. Hi Stu, thanks for the comment. I might quibble over the specifics, but you're absolutely right that that Kyocera was not without its flaws. My intention was not to lionize that particular camera, but rather to use it as an example in making this point: five years ago I was able to purchase a camera which, in a number of specific and easily measurable ways, was superior to anything I can get today. There doesn't seem to be any justifiable reason why that should be the case, and I find it frustrating.